This healthy, delicious low carb dessert is festive-looking, refreshing, and fancy. The best part is that you can make it in advance and experiment with the ingredients. Add your favorite fruit for more flavor. I often produce desserts that are tasty, simple, and new. 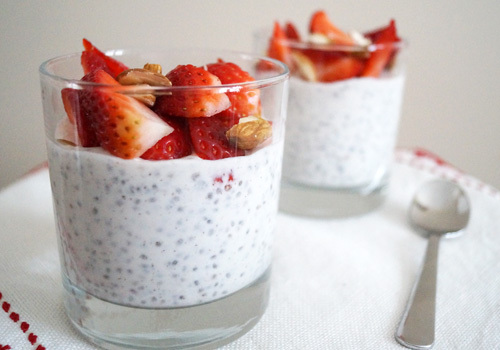 This chia seed pudding is a beautiful blend of fruits, cream, vanilla, and cinnamon and makes for a refreshingly different dessert, snack, or breakfast. If you are on the lookout for a nutritious, mouth-watering dessert or vanilla-rich treat, this pudding is a must-try! You will love the texture and rich flavors. Combine cinnamon, salt, and chia seeds in a bowl, add vanilla, and pour hot water. Mix well, add cream, and combine well. You can use almond or coconut milk instead of water. Stir gently until the mixture thickens. Refrigerate for 3 - 4 hours or overnight so that the seeds absorb liquid from the cream and soften. Divide into 4 cups and garnish with the sliced fruits. You can also garnish with whipped cream and raspberries, peaches, papaya, cranberries, or other low-carb fruits of your choice.